Dealer Bob Gault holds online car auctions via Auction Simplified. He sells “90 to 95 percent” of offerings, he says. Bob Gault, president of three dealerships in Endicott, N.Y., tried the usual ways to liquidate unwanted trade-ins. Wholesalers tended to show up at the wrong time and stayed too long. The auctions worked great. But their per-vehicle fees ranged from a few to several hundred dollars, depending on the price of the vehicle. Multiplied times the 100 to 125 units per month he typically sells, the fees could sometimes account for a loss, said Gault, whose dealerships sell BMW, Chevrolet and Toyota vehicles. So he joined a test last fall for an auction software product that enables him to hold his own online auctions. Now Gault sells on Auction Simplified, a product of Dealer Simplified. "We still do a little bit with the auctions, but we have an auction here every other Thursday, pretty much," he said. "We sell 90 to 95 percent" of the vehicles offered for sale. Years ago, dealers who wanted to get rid of aged inventory and unwanted trade-ins had to take those vehicles to a local physical auction. But that has gradually changed over the past decade. The traditional auction business model is being challenged by regional players and startups that are using technology to offer faster and easier ways to buy and sell used vehicles at wholesale. And because these companies don't have the overhead that traditional physical auctions have, they can offer their services for less money, even for free in some cases. At less than a year old, Dealer Simplified doesn't mind playing the role of David to the auction companies' Goliath. 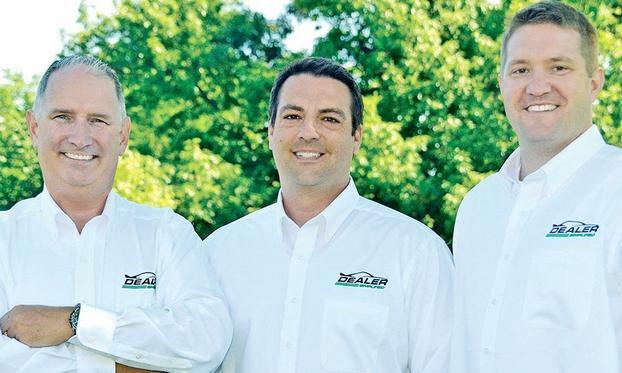 Dealer Simplified co-founders Kevin Leigh, Phil Gates and Dave Kaiser are former employees of the West Herr Automotive Group Inc., in Orchard Park, N.Y., which ranks No. 24 on the Automotive News list of the largest 150 dealership groups based in the U.S. The Auction Simplified product for now is being used by 10 dealership groups in the Buffalo and Rochester, N.Y., area. "But if we had a dealer anywhere in the country that wanted to do this, we could have them up and running in two or four weeks," said Leigh, former director of digital marketing and business development at West Herr. Dealers such as Gault pay nothing to sell their vehicles. Dealer Simplified collects a per-vehicle fee of $25 to $120 from the buyer and gives $20 of anything over $25 to sellers to help cover the costs of holding a public viewing of the vehicles prior to the auction, Leigh said.